Why Intellectual Standards? Why Teach for Them? 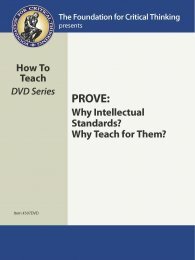 307DVD Why Intellectual Standards? Why Teach for Them? (Prove DVD) $14.95	 Qty. Although we may study many subjects, we don’t study them in a way that makes the criteria for assessing our thinking explicit. And though we express our thinking in what we say and do, we don’t reflect much on how we come to our beliefs and conclusions, or on the criteria we use in that process. In this tape, Richard Paul demonstrates the importance of making intellectual criteria and standards explicit in instruction. He provides examples of poor reasoning by both students and teachers in the absence of clarity in assessment.